Mon. 6. Lt. Mayer went to Columbus Ky to attend a court martial in Captain Doran’s case, as a witness for the prosecution. The 1st Lt. of Captain Doran’s Company, is one of the meanest rascals that ever breathed, who is trying to take vengeance upon the Captain in order to supercede him but I hope that he may not be successful. Tues. 7. I was officer of the day. 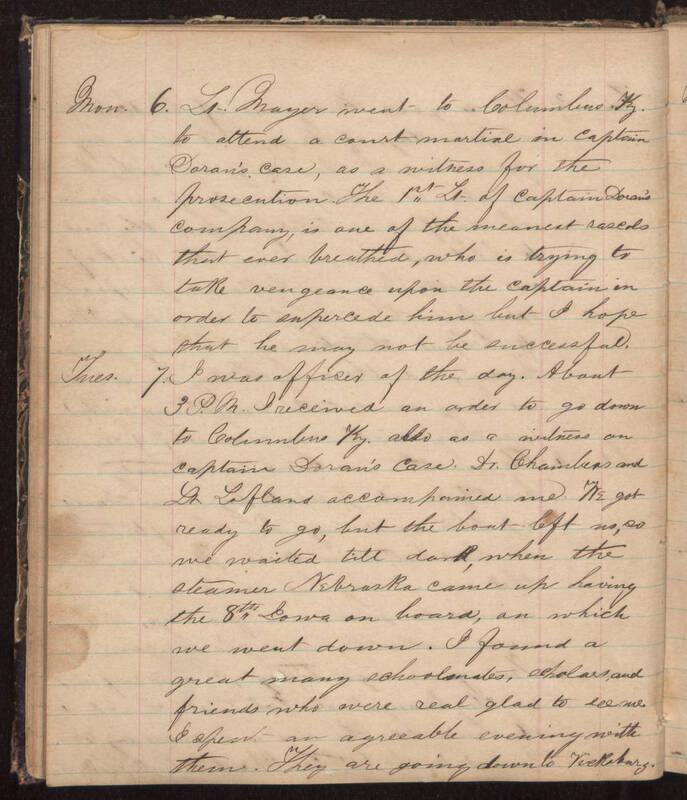 About 3 P. M. I received an order to go down to Columbus Ky also as a witness on Captain Doran’s case. Dr. Chambers and Lt Lofland accompanied me. We got ready to go, but the boat left us, so we waited till dark, when the steamer Nebraska came up having the 8th Iowa on board, on which we went down. I found a great many schoolmates, scholars, and friends who were real glad to see me. I spent an agreeable evening with them. They are going down to Vicksburg.